I don't know why. I just don't. This is the coolest character I've seen in a while. So much personality in this little guy! haha! Thanks for sharing. I've been following your stuff for a while now. I always love it! Photoshop is a great program, but you don't get as many happy accidents as you do in Painter. You might want to try a program called Sai. It's got great blending and also it's very very responsive. It's really nice for painting! LuisaPizza: It should be a meme. Gavin: I've been following your art for a long time also. I've heard other people recommend Sai before, but my home computer is a Mac (Sai is PC only). Maybe I'll put in a request at work for a few copies. That comment didn't really seem worth proving I wasn't a robot for, frankly. 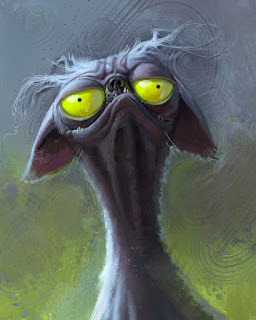 World's ugliest dog? Or... cat? Zia: Catdog. I don't know if it's the world's ugliest, though. You did that from memory, right? You were remembering me going through the rules at the party, and you were so overcome with admiration, you decided to do a portrait? Lol. Maybe you were having a waking nightmare. Very interesting!! You creative now doubt about that. Thanks for sharing.